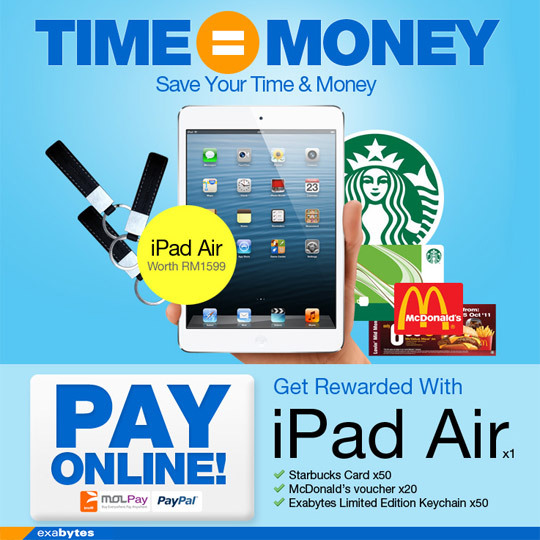 Home All About Exabytes Pay Online & WIN iPad Air, Starbucks Cards & Vouchers! Pay Online & WIN iPad Air, Starbucks Cards & Vouchers! In today’s modern society, time equals money. Imagine stepping out of your house, driving all the way to the bank and finding a parking space, JUST to make a payment! Your precious time can be SAVED by just making your payment ONLINE. If you have lost your password, please refer to the URL on how to retrieve your password. 2. After login, please go to ‘Due Invoices’. 3. Click on the invoice number to view your invoice. 4. To submit your payment via Credit Cards, please select from the drop down list and click on iPay88.com (Credit Card). We accept Master Card, Visa, Visa Delta, Visa Purchasing and Amex. If you have a PayPal account, you may also submit your payment via PayPal or set up a recurring payment via PayPal. 5. To submit your payment via Online Transfer, please select from the drop down list and click on iPay88.com (Credit Card)/MOLPay. We accept FPX, MayBank2U, Public Bank Online, CIMB Clicks, Hong Leong Online, RHB online, Bank Islam online, etc. 6. After your payment is submitted successfully, you will receive your receipt via email within 24 Hours. – No need to fax us the payment slip! So don’t WAIT! Pay Online & WIN Fantastic Prizes TODAY! Prizes are not exchangeable for cash or other Exabytes’ products. This contest is open to all Exabytes clients and Exabytes can only courier the prizes to addresses within Malaysia. Exabytes reserves the right to amend the terms and conditions without prior notice. Winners will be chosen randomly using a random generator software.